The Finnish Baroque Orchestra (FiBO) emerged as a pioneer in its field in Finland. Now, this nimble ensemble is adopting a new, democratic leadership model. With two artistic planners and an executive director, the orchestra aims to become a tighter-knit team competent not only in performance but also in audience outreach. The Sixth Floor Orchestra, the precursor of the Finnish Baroque Orchestra (FiBO), was founded in 1989 and brought together Baroque musicians of the then young generation. Standards have improved and operations expanded ever since, and one major milestone was the first performance in Finland of all of Beethoven’s symphonies on period instruments under Tuomas Hannikainen in the early 2000s. Only a short while earlier, a competitor to FiBO had appeared on the scene, the Helsinki Baroque Orchestra (HeBO). The two orchestras have developed very different profiles, even if they share many of the same members, particularly in their string sections. 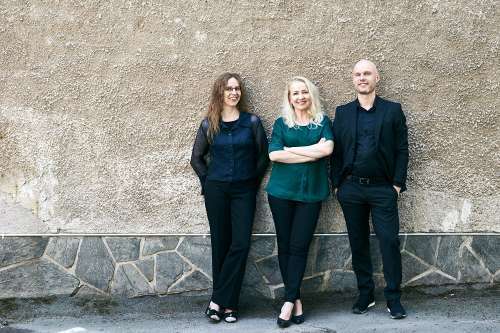 In recent years, FiBO has been led by violinist Antti Tikkanen, who is not just a Baroque musician but also an accomplished performer on the modern violin; among other things, he plays 1st violin with the Meta4quartet. “It was clear at the beginning of my tenure that this 25-year-old orchestra had to grow up and stop being vague for instance about who is a member and who isn't. We need to achieve a more coherent and independent membership that is logistically as robust as its performances are,” says Tikkanen. The orchestra ended up establishing a democratic but long-term administrative model where two musicians are elected from the membership for terms of 2+2 years to take charge of programme planning. As of the beginning of 2018, this power will be held by harpsichord player Petteri Pitko and flautist Pauliina Fred. The third member of the leadership trio is the executive director, who is in charge of administration and finances – violist Laura Kajander. “I see FiBO as a team with multiple voices, and as in polyphonic music, every voice has its role. We still have project-based operations and flexibility as our cornerstones, and I believe we’re in tune with the times as regards models in working life in general,” says Pitko. Baroque orchestras operate on a freelance basis out of necessity, due to financial constraints. At the moment, however, the new artistic planners of FiBO do not complain about a lack of resources or unfair treatment in public funding, as the orchestra’s central government contributions have grown by a factor of five over the past 10 years, from three person-years to 11. “Underlying this is the fact that our operations and performance sales have grown quite a lot,” says executive director Laura Kajander. In 2008, the orchestra only had a dozen projects; today, the annual number is more than 100. The orchestra now performs nationwide, in about 30 communities. Performing the same programme at multiple venues brings efficiency. “Partnerships are very important; that can mean anything from major choral projects to smaller-scale concerts, audience outreach and social engagement. Our residency at the House of Nobility has also increased our audiences. We used to struggle to get even 100 people to come to a concert, but now we mostly play to full houses,” says Kajander. FiBO is supported not only by the central government but also by the City of Helsinki and various foundations. The Bonsdorff Family Foundation is an important sponsor of the concerts at the House of Nobility. The core of the FiBO membership consists of 40 members who have a vote in deciding matters concerning the orchestra. Performances of Baroque music typically have a lineup of 15 to 25 musicians, but the ensemble is determined according to the repertoire. “We aim to divide up the year’s gigs equitably among our members. We also have associate members. About half of our projects are audience outreach and training projects, although sometimes it can be difficult to draw the line – training may be closely linked to concerts,” explains Kajander. The programme for spring 2018 presents three typical topoi of Baroque music, a topos being a theme, subject or mood that had its own specific idiom in the musical language of the era. Protestant sacred music will be performed in February, and British conductor Justin Doyle will visit to conduct Purcell’s opera Dido and Aeneas in April. In 2008, the orchestra set up an audience outreach team named FiBO Collegium, which is responsible for children’s concerts; outreach for the elderly; continuing education in Baroque music and its teaching materials; collaboration with music institutes; and extravaganzas under the title of Concerto Grosso, where a large number of young musicians join the orchestra on stage. In 2018, the Concerto Grosso event will expand into Viking Barokk, involving professional Baroque orchestras and music institutes from the five Nordic countries. Joint concerts will be held in Oslo and Helsinki in November and in Sweden, Iceland and Denmark in early 2019. FiBO is also involved in a joint project with the Avanti! Chamber Orchestra and UMO Jazz Orchestra to expand repertoire beyond traditional genre boundaries. Performing contemporary music on Baroque instruments is a long-standing project with FiBO. In summer 2018, the orchestra will be premiering a work commissioned from Sarah Nemtsov at the Time of Music festival in Viitasaari in central Finland. FiBO recently introduced a record label of its own, releasing a CD titled Moramoramor. It contains orchestral works by Bach and Vivaldi and contemporary composer Jukka Tiensuu’s work Mora, which the orchestra premiered in 2012. The soloist here, as at the premiere, is Topi Lehtipuu – though not so much as a singer as a performer of various shouts and other sounds that nevertheless follow the conventions of Baroque rhetoric. FiBO at the Musica nova Helsinki 2019 on 5 February. Read more about the festival and its artists in FMQ.